Curios and Dreams | Makeup and Beauty Product Reviews : Hail the Spring! 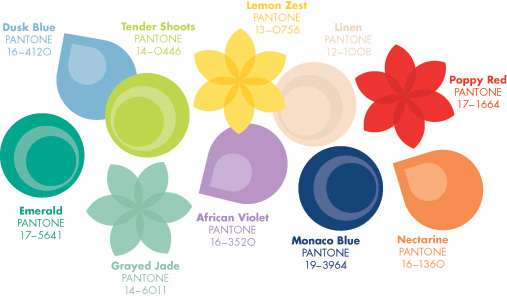 Pantone has unveiled the colours which will rule trends in spring 2013. Personally, I'm loving the fresh and vibrant palette, and can't wait to incorporate them into my wardrobe! These hues are so versatile, you can go completely crazy with them, yet remain in your comfort zone. Now, isn't that a win-win situation? Pantone has juxtaposed bright colours with classic ones, creating a perfect balance; the deep shades anchoring the dynamic. The result? Striking combinations that are wearable, yet compel onlookers to shoot appreciative second glances. Don the Poppy Red, and dare the world to ignore you! Get in touch with your masculine side with Monaco Blue. Celebrate your effervescent spirit with Lemon Zest and Nectarine, or choose a Zen-like calm with Grayed Jade and Dusk Blue. Drape yourself in the royalty that African Violet and Emerald offer. Or go natural with Tender Shoots and Linen! Monaco Blue- denims, nail polish, or maybe a bikini haha! And as an example, here is how I would style my outfit. Linen as a print, paired with classic neutrals black and white, and a pastel jacket. Oh, and a Poppy Red bag for a dash of colour. How will you wear the spring trends? Got any fave colours out of all? We'd love to hear your thoughts! I'm now following you on GFC, look for Smriti Ram under your fan following.